An Imposing Detached Victorian Residence in a Highly Regarded Semi Rural Location. 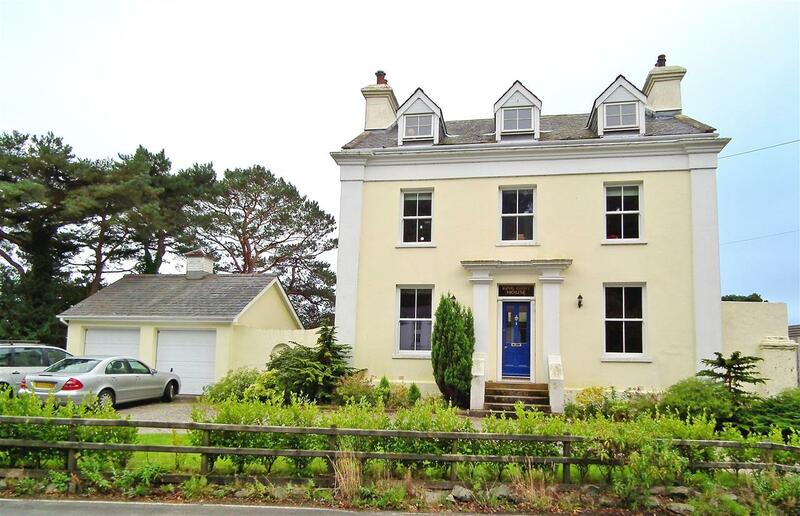 Situated on the Outskirts of Laxey Village & Enjoying Superb Sea Views. Set within Generous, Landscaped Gardens. Lounge & Adjacent Family Room, Dining Room & Full Width 'Everest' Conservatory. Country Pine Breakfast Kitchen, Utility Room and Cloakroom WC. 4 Double Bedrooms to the 1st Floor plus Family Bathroom with a Separate Shower. 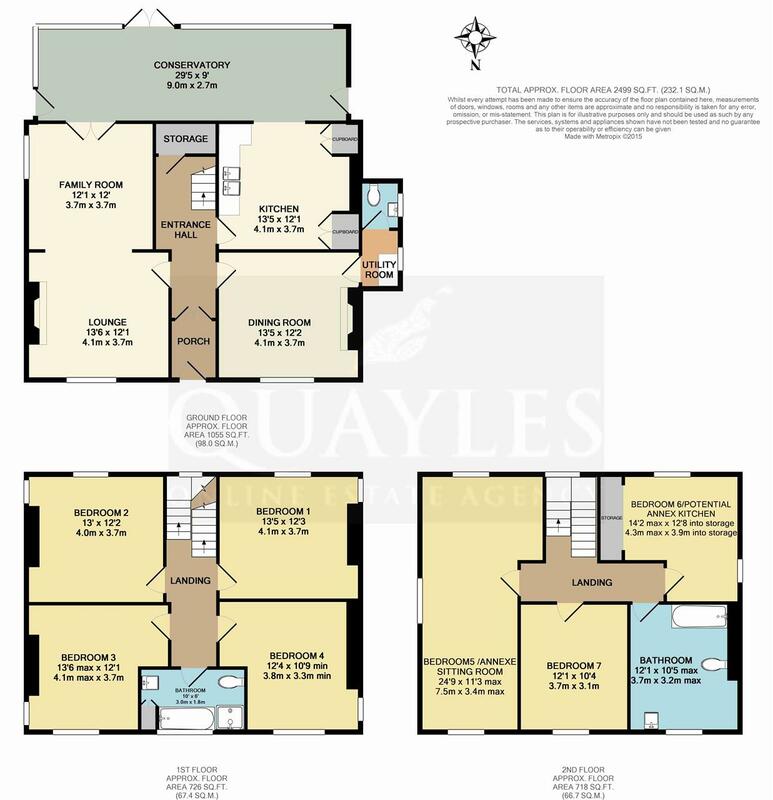 3 Further Double Bedrooms and Bathroom to 2nd Floor (Potentially a 1 Bed Annexe). Oil Fired Central Heating. Primarily Double Glazed by 'Everest' with uPVC Fascias & Soffits. Detached Double Garage and Extensive Off Road Parking Facilities. Rear Garden with Attractive Indian Slate Patio, Lawns & Established Shrubbery. Travel out of Laxey village via Ramsey Road. The property will be found on the right hand side of the road just after the crossroads between Ballaragh Road and Minorca Hill. Steps up to an original, part glazed panelled entrance door with top light. Coconut matting. Display shelving. Part glazed double doors open into the reception hall. Original corbels and cornice. An attractive staircase with a glazed light and uPVC window to the half landing leads to the upper floors. Deep, L shaped understairs cupboard with coat hooks. A good sized room featuring a cast iron open grate fireplace with a pine surround, slate hearth and ornate brass fender. To the front is a uPVC sash style bay window with original panelled surround. Cornice, picture rail and decorative ceiling rose. Dimmer lighting control. Clear square opening to the family room. Featuring an identical fireplace to the lounge. Cornice, picture rail and decorative ceiling rose. Having a uPVC double glazed window to the side elevation. Television and satellite points. Glazed double doors lead through to the conservatory. A full width 'Everest' conservatory installed approximately 2008 and having a glazed pitched roof with a top opener, plenty of opening windows and double doors leading out to a large patio area, offering superb views across the bay to Clay Head. Additional doors to either side. Four directional spotlight fittings on dimmer controls. Two radiators and numerous power points. Clear opening to the breakfast kitchen. A good sized room with space in the centre for a table and chairs or island unit. Fitted with an excellent range of solid pine fronted wall and base units together with spice drawers and display shelves. Built in alcove cupboards to match, one shelved, one housing the 'Trianco Utility' oil fired central heating boiler and insulated hot water cylinder. Solid wood worksurfaces and dual butlers sink with swan neck mixer tap. Space for a dishwasher and freestanding fridge freezer. Integrated freezer. Deep recess with pine surround having ample space for a double width Range style cooker. Coved ceiling with a period style spotlight fitting. Telephone point. Terracotta tiled floor. Part glazed door to the reception hall. Enjoying a pleasant outlook via a uPVC sliding sash style window. Open grate fireplace with integral surround. Picture rail and decorative ceiling rose. Dimmer lighting control. Quality 'Amtico' oak effect floor covering. Door to the utility room. Two wall units, one housing the consumer unit. Obscure glazed uPVC window to the gable end. Work surfaces with space beneath for a washing machine and tumble dryer. Door to the cloakroom. Fitted with a white 'Armitage Shanks' suite comprising WC and wall mounted wash hand basin. Obscure glazed timber framed window. Wall mounted, mirror fronted vanity unit. Power points. Smoke detector. Stairs continue to the second floor, a uPVC window to the half landing offers views over the garden and Laxey Bay coastline. A good sized double room with dual aspect uPVC windows to the side and rear, the latter enjoying stunning sea views across the gardens towards Clay Head. Picture rail and alcove shelving. A further double room located at the front of the property and again having dual aspect uPVC windows to the front and side. Picture rail. Light on a dimmer control. Nb measurement excludes door recess. Tiled to mid height and fitted with a 'Shell' style suite comprising panelled bath, WC and pedestal basin with mirror and shaver point above. Fully tiled cubicle with bi fold doors housing a 'Mira' Extreme electric shower. Part obscure glazed uPVC sliding sash window. Built in linen cupboard. A further, dual aspect, double room located to the front. Picture rail. Built in shelving. Light on a dimmer control. A wonderfully bright and spacious double room with dual aspect uPVC double glazed windows to the side and rear, the latter enjoying fabulous sea views. Cornice and ceiling rose. Telephone point. 'Velux' roof window. Smoke detector. A spacious, triple aspect room, running the depth of the property, ideal for use as a teenagers sitting room or similar. A rear facing uPVC window provides fantastic hill and coastal views. Television point. A double room with a uPVC window to the front elevation providing a pleasant wooded outlook. Access to the loft. A large room, fitted with a white, period style suite comprising panelled bath with background tiling and overhead electric shower installed, WC and pedestal basin. A uPVC dormer window to the front offers a pleasant wooded outlook. Vinyl floor covering. A good sized, dual aspect double room currently used as a home office with a recessed, shelved storage area. The second uPVC window provides stunning coastal views to the rear. Telephone point. A recently laid paved patio, surrounded by well stocked, mature flower beds is accessed from the conservatory and makes an ideal outside entertaining area, taking advantage of the superb coastal and hill views. Steps lead to a small lawned area with access to the double detached garage. Wooden gates to the side open into a further parking or boat store area. A Manx stone wall with central steps, flanked by palm trees lead down to the first lawn area with mature trees and shrubs to the side. Manx stone steps lead down to the second lawn with Manx stone retaining walls, once again bordered with mature shrubs and specimen trees. A paved pathway with gated access onto the front drive. Cold water tap. Oil storage tank. Gravelled steps lead along the side of the garden to the lawn. A wide gravelled in and out driveway with Griselinea hedging to the front and shrubs to the side boundaries provides parking for numerous vehicles. Colourful planted beds. Night light. Accessed via two up and over doors. Mains water, electricity and drainage are installed. Oil fired central heating and 'Everest' uPVC double glazing to the majority of th property.